These are formatted to print 11 X 14. Simply download "Original" version and send to your lab for processing. 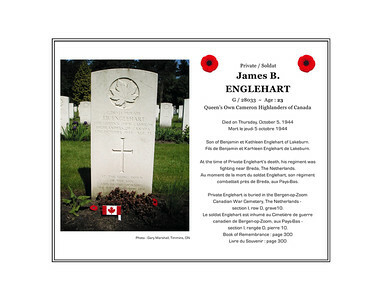 James Benjamin ENGLEHART, private, G/28033, age 23, Queen’s Own Cameron Highlanders of Canada, died on Thursday, October 5, 1944. He was the son of Benjamin and Kathleen Englehart of Lakeburn. He is buried in the Canadian War Cemetery at Bergen-op-Zoom, The Netherlands (section I, row D, grave 10). 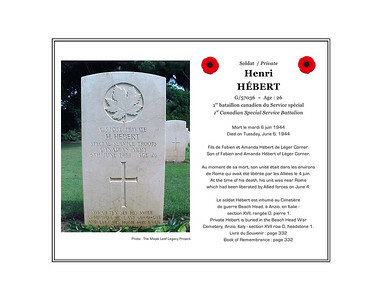 Henri HÉBERT, private, G/57036, age 26, 1st Canadian Special Service Battalion, died on Tuesday, June 6, 1944. He was the son of Fabien and Amanda Hébert of Léger Corner. He is buried in the Beach Head War Cemetery, Anzio, Italy (section XVII,row D, grave 1). Raymond LEBLANC, private, G/50732, age 24, Royal Hamilton Light Infantry, died on Friday, March 2, 1945. He was the son of Napoléon and Amanda LeBlanc of St. Anselme. 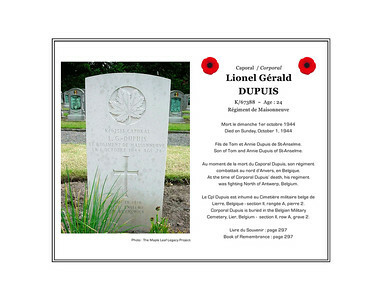 He is buried in the Canadian War Cemetery at Groesbeek, The Netherlands (section XXIV,row A, grave 6). 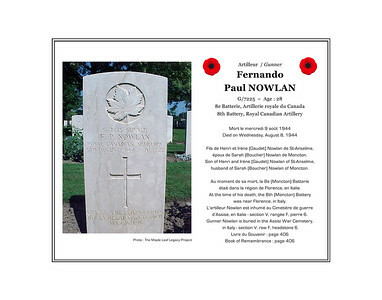 Fernando Paul NOWLAN, gunner, age 28, G/7225, 8th Battery (Moncton), 2nd Field Regiment, Royal Canadian Artillery, died on Wednesday, August 9, 1944. He was the son of Henry Nowlan and Irène (Gaudet) Nowlan of St. Anselme and husband of Sarah (Boucher) Nowlan of Moncton. He is buried in the Assisi War Cemetery, Assisi, Italy (section V, row F, grave 6). 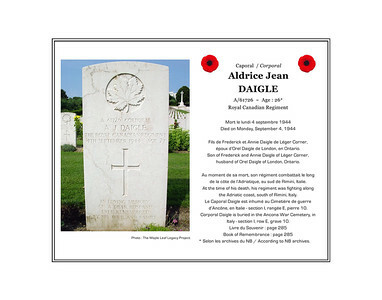 Aldrice Jean DAIGLE, corporal, A/61726, age 27, Royal Canadian Regiment, died on Monday, September 4, 1944. He was the son of Frederick and Annie Daigle of Léger Corner and husband of Orel Daigle of London, Ontario. Corporal Daigle is buried in the Ancona War Cemetery, Italy (section I, row E, grave 10). 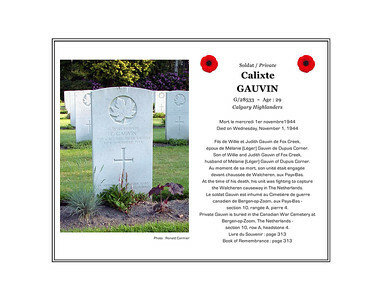 Calixte GAUVIN, private, G/28533, age 29, Calgary Highlanders, died on Wednesday, November 1, 1944. He was the son of Willie and Judith Gauvin of Fox Creek and husband of Melanie Gauvin of Dupuis Corner. Private Gauvin in buried in the Canadian War Cemetery at Bergen-op-Zoom, The Netherlands (section 10, row A, grave 4). 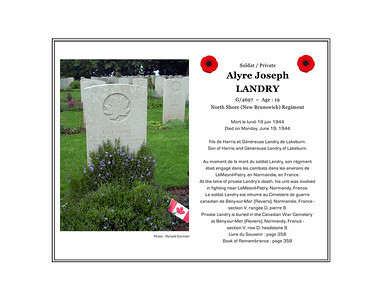 Alyre Joseph LANDRY, private, G/4697, age 19, North Shore (New Brunswick) Regiment, died on Monday, June 19, 1944. He was the son of Harris and Généreuse Landry of Lakeburn. 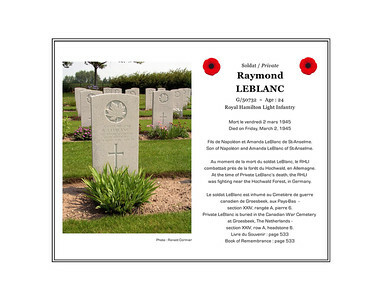 He is buried in the Canadian War Cemetery at Bény-sur-Mer, France (section V, row D, grave 9). 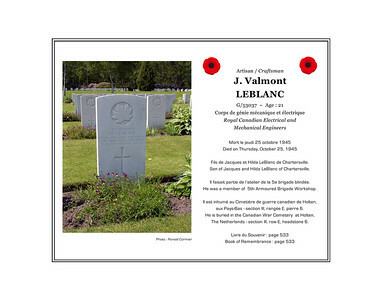 Valmont Joseph LEBLANC, craftsman, G/53037, age 21, 5th Armoured Brigade Workshop, Royal Canadian Electrical and Mechanical Engineers, died on Thursday, October 25, 1945. He was the son of Jacques and Hilda LeBlanc of Chartersville. 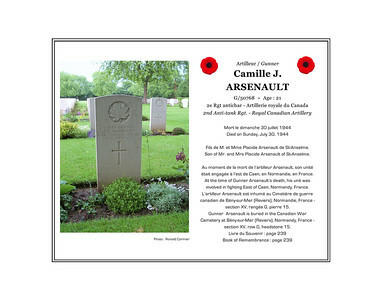 He is buried in the Canadian War Cemetery at Holten, The Netherlands (section III, row E, grave 6). 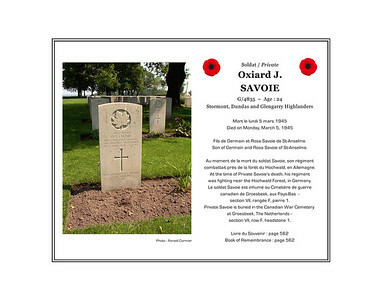 Oxiard SAVOIE, private, G/4835, age 24, Stormont, Dundas and Glengarry Highlanders,died on Monday, March 5, 1945. He was the son of Germain and Rosa Savoie of St. Anselme. He is buried in the Canadian War Cemetery at Groesbeek, The Netherlands (section VII, row F, grave 1). Lionel Gérald DUPUIS, cprporal, K/67388, age 24, Régiment de Maisonneuve, died on Sunday, October 1, 1944. He was the son of Tom and Annie Dupuis of St. Anselme. Private Dupuis is buried in the Belgian War Cemetery in Lier, Belgium (section II, row A, grave 2). 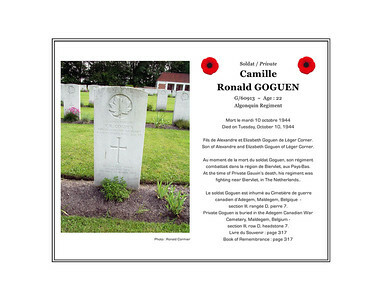 Camille Ronald GOGUEN, private, G/60913, age 22, Algonquin Regiment, died on Tuesday, October 10, 1944. He was the son of Alexander and Elizabeth Goguen of Léger Corner. Private Goguen is buried in the Adegem Canadian War Cemetery, Maldegem, Belgium (section III, row D, grave 7). 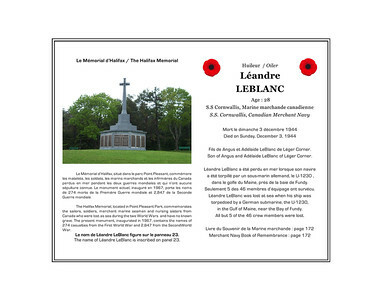 Léandre LEBLANC, oiler, age 28, SS Cornwallis, Canadian Merchant Navy, died on Sunday, December 3, 1944. He was the son of Angus and Adelaide LeBlanc of Léger Corner. He is remembered on the Halifax Memorial, Point Pleasant Park, Halifax (panel 23). 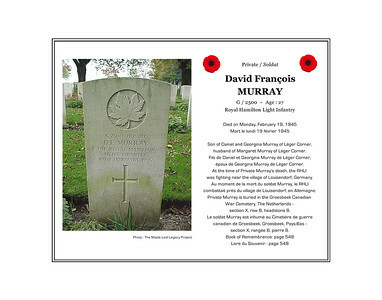 David François (Francis) MURRAY, private, G/2500, age 27, Royal Hamilton Light Infantry, died on Monday, February 19, 1945. He was the son of David and Georgina (Gauvin) Murray of Léger Corner and husband of Margaret (Bourgeois) Murray of Léger Corner. Private Murray is buried in the Canadian War Cemetery at Groesbeek, The Netherlands (section X, row B, grave 8). 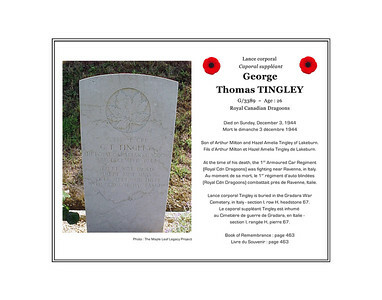 George Thomas TINGLEY, lance-corporal, G/3389, age 26, 1st Armoured Car Regiment,Royal Canadian Dragoons, died on Sunday, December 3, 1944. He was the son of Arthur Milton Tingley and Hazel Amelia Tingley of Lakeburn. He is buried in the Gradara War Cemetery, Gradara, Italy (section I, row H, grave 67).